Brothers from different mothers, bromancing history to save us from Trump. These are the continuing adventures of Barack Obama and Joe Biden, time traveling superheroes in search of a brighter future for America. Moments after the inauguration of our 45th President, best friends Barack Obama and Joe Biden were escorted to a secret lab run by the world’s greatest scientists. They were asked to take off all their clothes and hold very still in a fetal position until they felt a painful tingling sensation. Then they vanished. They would awake to find themselves apart, and inside their younger bodies—driven to find each other and change history for the better. Their faithful guide on this journey is Samuel L. Jackson, a brilliant actor from the present who appears in the form of an augmented reality that only they can see and hear. And thus, they find themselves leaping through time, striving to right injustice wherever they find it, looking for a world which they can proudly call home. This audiobook is a love letter to cheesy science fiction and the two men who can still be counted on to inspire us—an adventure that will melt your snowflake brain and give you hope for humanity at the same time. Brothers from different mothers, bromancing history to save us from Trump. 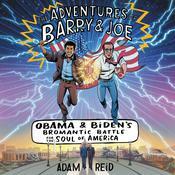 These are the continuing adventures of Barack Obama and Joe Biden, time traveling superheroes in search of a brighter future for America. Moments after the inauguration of our 45th President, best friends Barack Obama and Joe Biden were escorted to a secret lab run by the world’s greatest scientists. They were asked to take off all their clothes and hold very still in a fetal position until they felt a painful tingling sensation. Then they vanished. They would awake to find themselves apart, and inside their younger bodies—driven to find each other and change history for the better. Their faithful guide on this journey is Samuel L. Jackson, a brilliant actor from the present who appears in the form of an augmented reality that only they can see and hear. And thus, they find themselves leaping through time, striving to right injustice wherever they find it, looking for a world which they can proudly call home. This audiobook is a love letter to cheesy science fiction and the two men who can still be counted on to inspire us—an adventure that will melt your snowflake brain and give you hope for humanity at the same time. Adam Reid is a writer and director known primarily for high-end commercial work. He co-founded the production company and agency Bodega Studios where he drives original creative through development, production and post. He lives in Maplewood, New Jersey with his wife and two sons.